I just recently had my Diamond Pro Am delivered that I purchased from Heath Manning of Manning Cues. With Heath I had a great experience from when I first spoke to him about a price quote to when the table was finally delivered. Heath took the time to answer all of my questions throughout the process and gave me updates on the progress of the table while it was being built. 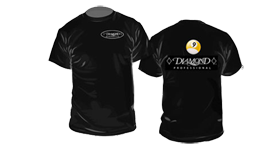 If you want to purchase a Diamond Pro Am or anything else billiards related, Heath Manning is your guy! I spoke to different people that was selling the Diamond Pro Am tables and decided to go with Manning's, due to the fact that he took the time to explain and answer all my questions and also gave some good advice. I felt very comfortable dealing with him compared to the other dealerships. Manning stayed in contact with me with updates on when the table was going to leave the factory, be delivered and set up. When the table was delivered there were some scuff marks and 1 scratch, I called Manning and told him about same, he replied hold on for a second I will get Diamond on a conference with us, after the conference call was made ,Manning seen to it that all 6 rails were changed and that I was happy with the final results, which I was. I would encourage anyone looking to buy a Diamond table to contact Manning's as their first choice. It was a pleasure doing business with Manning's, thanks for everything you made happen. I received my Diamond Pro Am 2 weeks ago and could not be happier, the table is beautiful and plays absolutely perfect. The service from start to finish from Manning Cues was excellent! This is the best table on the market in my opinion to have at home. The ball return is very fast and barely makes any noise. I looked around for the best price and Heath had the lowest. One downside of the process was that 1 part came broken, however it was neither Heath's or Diamond's fault but the shipping company's instead. Took about 1 week to get that part replaced, which wasn't bad at all. Overall, I am very satisfied with this purchase and recommend not only this table, but the amazing service Heath offers everyday. Heath was informative, helpful, and extremely efficient. I submitted a request through the site to be contacted, and he even called me past their listed business hours! I couldn't believe I got a response so quick! Then he took the time to answer all questions and thoroughly explain the process and pricing. Not only this, but I ended up getting my table in 1/3rd of the time that he said I would! Someone cancelled so he called me to bump me up on the list. Great guy. If you want the best quality table for your money, don't go to a second-rate or third party seller. Go to the Certified Diamond Dealer of North America -- Manning Cues. Thanks again Heath, my table is PERFECT. Smooth action, quiet (and fast) ball return.. just amazing! Super happy customer! The mechanics who installed the table were great people too. Very fast and helpful. Disadvantages: NONE AT ALL. SERIOUSLY. 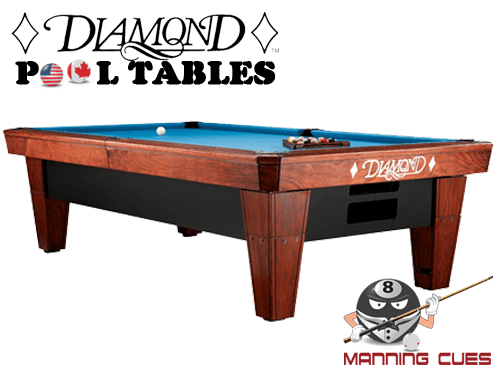 I ordered the Diamond Pro-Am 9’ table with the tournament blue Simonis 860 cloth and couldn’t be happier with the table. It plays perfect, just like I knew it would. I’ve wanted one for many years now and decided to order from Manning’s Cues because of all the positive reviews I read online. Well, they were spot on accurate. Heath Manning handled my order personally and kept in touch with me every step of the way. Heath called me to notify me that the table was coming sooner than he had and asked me if that was okay and I was very pleased with that. The two guys who delivered my table, Chris and Rick, took every precaution to make sure the table didn’t get scratched and neither did my home, which I really appreciated. They made the set up look so simple and were in and out in less than 90 minutes with the table leveled and ready to play on. I also ordered the Diamond light to match the table and I’m glad I did, it looks great and works beautifully. I’m 52 years young and I have to say the customer service I’ve received from Heath Manning is some of the best I’ve ever experienced. If you’re serious about getting a world class table, you owe it to yourself to deal with a world class customer service professional like Heath. Pool table is excellent! Heath was a complete professional from front to finish - he even advised me properly on the material of the pool table to get. He was also hands-on with the process the entire time. I would highly advise this experience to anyone. I ordered my Diamond Pro table from Heath at Manning Cues, best move I ever made. From start to finish he answered all of my questions, and helped me choose what I needed. The delivery team of Mike and Gary were the best, took their time, and explained everything to me as they were installing the table. There was a problem with one of the legs, and they assured me it would be taken care of by Diamond. Heath phoned me to assure me that it would be taken care of in 2 to 3 weeks. 3 weeks later it was fixed perfectly. I would recommend anyone looking for a diamond table to get it from Manning Cues. A Diamond table would be my largest purchase behind my home and vehicles. I read multiple reviews, forums, etc., before contacting you about the 9' pro-am. Production and delivery went exactly as you described on our initial call. Every time I emailed for a delivery update, you called or responded the next time I checked my email. My experience could not have been any better with Manning. Advantages: Absolutely the best table from the best provider. Consistent rails, pro cut pockets, leveling system, quiet ball return, makes you a better player, love the look and durability of the dymalux. Without a doubt, BEST customer support you will ever find. If you're like me and reading through the reviews, you may be skeptical about every review being extremely positive. There is a good reason for that. Let me tell you about my experience. In your very first conversation with Heath Manning, he will reassure you that he will take care of you. I can't stress how true this is. The day I took delivery of my table, the freight company rolled it out on the forklift and stuff was literally falling out of the crate. I was sick with disbelief that my Diamond table had just come in damaged. I made a call to Heath and left a message. Not expecting a reply that day as it was after business hours, I got a call within a few hours. Heath reassured that everything would be made right and I would be completely satisfied with the end results. He saw to it that I got all new replacement parts for my table. Heath Manning will do everything possible to make sure you are more than satisfied. I could not be happier with the end results. Super quality table. My friends and I are very favorably impressed with the eye appeal and workmanship of this table. The purchase, communication, and delivery were the best I've experienced buying anything from anyone. Unbeatable customer service. I purchased my Diamond Pro-Am because of Heath's numerous outstanding reviews and he certainly went over the top to ensure I was happy. From the first phone call, to answering numerous questions while in production, to calling after the set up, he was always there to ensure I was happy. Cannot be happier about the purchase and I intend to purchase all my billiard products from Manning Cues. Disadvantages: I don't have enough time to play on my amazing table. I love my table and am extremely happy I purchased from Manning Cues. Heath was very informative and helpful. Advantages: Heath is very knowledgeable about the Diamond Pro AM and is always a phone call away. Exceptional customer service before and after the sale. This is the one and only place to buy a Diamond table. From the 1st initial call to the installation Heath is top notch. Everything came as promised, the table is incredible, install was quick, and it came 2 weeks early. If you want service, Heath is your guy. A+ all the year at around. 8’ Pro-Am, Cyclop balls, Bridge rack, Table cover, matching wood triangle rack. Advantages: The best table money can buy (my personal opinion) at the best price I could find. Delivered 2 weeks early. Disadvantages: There are no disadvantages. My Diamond Pro-Am pool table is exactly as I expected. One of the best tables money can buy. Heath Manning took the time to answer all my questions and walked me through the entire process. The customer service was outstanding. I was thoroughly impressed with the table installation. I had some space constraints and they helped to minimize those by placing the table in the best spot possible. They took their time and did not damage anything while getting the table into my basement. I couldn't be happier with the final result. Advantages: Great table and great service. Disadvantages: Slight delay in production caused the table to arrive a couple weeks later than expected. However, Heath Manning kept me informed throughout the entire process. I had two overnight rental cabins burn down in the 2016 fires in Gatlinburg Tn. I purchased two 8 foot Diamond Pro-Am tables and accessories through Heath for the game rooms. There were several delays in the building process so I had to change the schedule for the tables to be delivered several times. Heath coordinated these changes seamlessly and never complained. Heath was a pleasure to work with. We wanted to have top of the line amenities for our guests to enjoy, so getting the Diamond tables was a no-brainer. They are durable and easy to maintain which is a must in the overnight rental business, and with playability that is second to none. The tables, light and cue rack look awesome in the game rooms. Buying these tables and getting them delivered and set up was the easiest part of our re-builds, thanks to Heath. I will always buy my stuff from Heath. He has truly earned my business. Thank You, Heath! If you’re looking for a new diamond table, look no further...Manning is your guy! He knows his stuff, gets back to you timely and keeps you informed! You won’t find a better price or service, and the installers are meticulous and top notch! My table was also installed a few weeks early! Advantages: Most consistent playing table out there! And excellent installation! Disadvantages: Not cheap, but if you’re not a serious player then you’re not even reading this review! My Diamond table came in as ordered, very pleased! Thank you Heath for your diligence and excellent customer support, Manning Cues is highly recommended for any pool needs you night have, I'm a long time client for a reason and I'll keep coming back, well done! Advantages: Have played on many tables from different manufactures and the one that stroke gold with me is the Diamond Pro Am. Is a fast table which makes you control cue ball speed better, it makes you a better player. The slate goes into the pocket deeper than most tables, again it makes you shoot center pocket at all time, making you a better player. Rails are fantastic, not too short or not too long on bank shots, not too fast or slow, in my view, the best playing table on the market, wouldn't go anywhere else, thank you Diamond! Fantastic! The table is perfect! Mr. Manning answered all of my questions, was the best price, was available by phone when I called and was with me from the time I first called to the day my table was installed. You don't find old fashioned genuine customer service like this anymore! Advantages: Professional grade table that looks as great as is plays. Mr. Manning arranged the installation by Diamond certified installers for a no headache experience. The installers were excellent and explained what they were doing and adjusted the table to my liking. Disadvantages: None - Worth every penny, no regrets and would recommend that anyone looking for a Diamond speak with Mr. Manning. The table is absolutely beautiful. They say a Diamond is a girls best friend; I agree!! I contacted Heath about four months before I purchased my table. He went over all the details of my upcoming purchase. I did not purchase anything from him at this time, but he patiently answered every question I had. Two full months later I contacted him again and told him I was ready to order. He still had everything we discussed two months earlier. I had the table ordered in less than ten minutes! Advantages: No "pushy" sales person. Dealing with only one person. I got my table a full month ahead of production! Disadvantages: I can't think of a single one except he lives to far away for me to shake his hand. I love my new 9' Pro-Am. Heath gave me the best price I could find and was always available to answer any questions I had. Table was delivered in 12 weeks after order as planned. Install went great, Chris Duncan and Rick Beams did a fantastic job. If your thinking about getting a Diamond, Heath is the man to call. Thanks for everything Heath. Advantages: I believe this is the best table on the planet. Just my humble opinion. Disadvantages: Can't think of one. I just received my new 9' Diamond Pro Am. Diamond tables are one of, if not the best table in the industry. Heath Manning is a top notch business man. Heath worked with me directly, from start to finish. Heath kept me up to date on manufacturing lead times and expected delivery dates. He responded to emails and phone calls; night, day and weekends. I have had a dream of owning a 9ft Diamond pro am for nearly 18 years. Manning Cues made that dream a reality! The personal customer service and professionalism of Heath Manning himself are definitely unmatched just as advertised! You can't possibly find anyone any better. My table was delivered on time and professionally Installed within 2 hours! Thank you Heath and Manning Cues for making my dream come true! Excellent quality from Diamond and excellent service from Heath. I had my table installed 11 weeks from the time I ordered which was a week ahead of schedule. Heath was available anytime I called to answer my questions. Heath personally called me after the install to make sure I was satisfied. The table mechanic Shane did an excellent job with the installation as well. I would have no reservations ordering another table through Heath. Advantages: The table is a Diamond. Simply put, best playing table In production in my opinion. Balls roll true. Pockets are tight, but fair. Rails provide a solid hit and give you confidence that the ball is going to bank true every time.